It has been a long time in the making... but it is finally ready for all to see and enjoy! Corey, my web developer, and I have worked on getting this new site ready for months now. Corey has put it endless hours to get the new website to where we wanted it. Everytime we thought it was done, I changed my mind and had him redesign major sections. This is the reason why it has taken so long. Family Photos Just in time for Christmas! 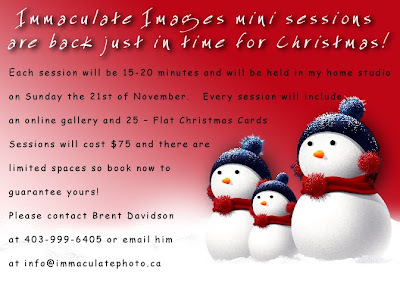 Immaculate Images Photography is offering last minute Christmas Mini Sessions! Each Session will be 15-20 minutes long and will be held in my home studio on the 21st of November. Every session will include an online gallery of select images and 25 - 5x7 Flat Christmas Cards. Sessions will cost $75 and there are limited spots so book now to guarantee yours!